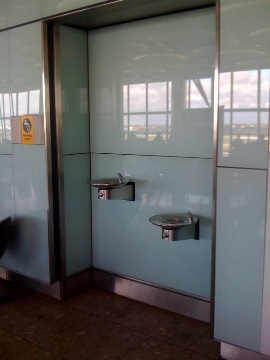 We have a variety of drinking water fountains that are perfect for installation at airports. They’re designed for indoor and outdoor use. Apart from their practical applications of providing safe drinking water, some of our range of fountains are designed with aesthetics in mind. Our range of drinking water fountains look just as good as they work, so you can choose a product that will form part of your airports décor. We pride ourselves in offering effective fountains that provide people with safe drinking water. Drinking Water Fountains takes pleasure in knowing that our products and services go a long way in encouraging people to consume the precious resource, and we’ll continue to provide such an exceptional service throughout the country. Water makes up an average of 75% of the human body. This makes it the essence of life, as its constant consumption is necessary for survival. Our bodies need it to function at optimum capacity, making it important for water to be accessible, especially in public places such as airports where drinking water fountains are the most convenient products to have around. Get airport drinking water fountains from the industry experts on providing the precious resource. Contact Drinking Water Fountains today to get the product that meets the demand.